Spanish regulators suspended subsidies to 279 solar-power installations, bringing to 1,561 the number of rooftop and open-field installations punished for not proving they followed rules for earning above-market prices. The National Energy Commission announced the latest series of sanctions after completing checks on 86 percent of the 8,201 power stations suspected of not meeting regulatory requirements, the regulator said today in statement. The owners of photovoltaic parks and rooftop systems failed to prove they were capable of producing power by the Sept. 30, 2008, deadline to be eligible for earning the highest consumer- subsidized rate. That tariff is 47.5 euro cents ($0.678) a kilowatt-hour, or about nine times today’s spot price paid to operators of fossil fuel power plants. Spain’s government is trying to reduce aid for many of the nation’s renewable-energy plants as a way to lower electricity costs for businesses and homes and help the economy emerge from its worst slump in 60 years. Armed with a law passed in 2010, the energy regulator this year requested more proof from 9,041 operators of solar plants and rooftop gear that they had completed all construction and permitting by the September 2008 deadline. Spanish news reports had suggested hundreds of entrepreneurs were illegally earning the top subsidized rate, which was lowered after 2008. Some 840 operators agreed not to challenge the regulator and accept a lower subsidized price of 32.6 cents a kilowatt- hour for the power they produced, in a form of amnesty agreement that avoided them losing their entire subsidy payment. The 1,561 installations to be penalized generate about 5.5 percent of the country’s photovoltaic power. The suspensions handed out so far are “precautionary” until final judgments are made, the commission said. Gems from a collection once owned by the late first lady of Argentina, Eva Peron, which had been stolen in Spain two years ago, were found in a luxury hotel in Milan, Italian police said. The jewels, worth 6 million euros, include a set of diamond rings, earrings and a tiara given to Peron by the Dutch royal family. Lieutenant-Colonel Antonino Bolognani from Milan's investigative force told a news conference the occupants of the hotel room were on the run. They are part of a group from Serbia who had lived outside of Milan and set up scams involving fake bank notes organised through the internet. Posing as sheiks and Middle Eastern investors, the thieves persuaded the owners of the Joyas Sofia jewellery shop in Valencia, Spain to sell them the collection, acquired from Peron's heirs after her death. During a meeting in December 2009, the thieves asked the jewellers to put the gems on a desk while they counted the 10 million euros payment. "Under the desk was hiding one of the accomplices, substituting the real money with fake bank notes under the eyes of the victims," Lieutenant-Colonel Bolognani told reporters. The sellers suspected something was wrong and the thieves ran, grabbing the jewels. After months of investigations by Spanish and Italian police six of the gang members were arrested in Spain in May 2010 and another man was held in Milan. When police broke into the Italian hotel room on Tuesday a member of the gang escaped, leaving behind him about three quarters of the missing jewels. Peron, who was known as Evita, died of cancer in 1952 and her husband, Juan Peron, was ousted by a coup three years later. He returned from exile to become president again in 1973 but died a year later. 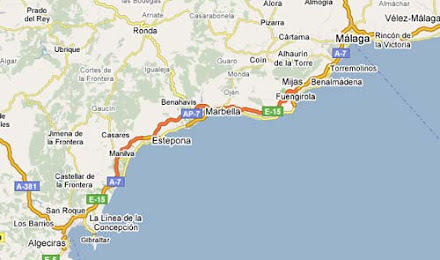 WELL-KNOWN businessman died after an accident on the first day of his holiday on the Costa del Sol. Self-employed plumbing and heating engineer Gordon Taylor, 49, of St Helen Auckland, County Durham, slipped on rain-soaked paving tiles on a night out and hit his head, an inquest heard yesterday. The accident happened at the end of October at the gated holiday complex in Benalmadena, Malaga, Spain, where Mr Taylor was staying with his wife, Elizabeth, and her relatives. He was found some time later lying unconscious near a gate by a fellow holidaymaker. He was taken to Malaga Hospital, where he died after more than three weeks in a coma. County Durham Coroner Andrew Tweddle said the post-mortem examination conducted when Mr Taylor’s body was flown back to Britain revealed that he died of head injuries. Tests showed he had a high level of alcohol in his blood. Mrs Taylor told the hearing that she returned to the couple’s one-bed apartment after they had been out, but her husband decided to go out again. The following morning, after finding he had not returned, she discovered from the complex reception that a man had been taken to hospital. Mr Tweddle said there was no evidence of crime, and no jewellery or money had been taken from Mr Taylor. There were no witnesses, so Mr Tweddle said his best guess was that Mr Taylor hit his head because he had been unsteady on his feet and had slipped on the wet tiles. Afterwards Mrs Taylor, 49, said her husband had died from a minor mishap, but that others in the hospital had survived a balcony fall and being hit by a train. She said: “You ask yourself questions, but at the end of the day there is only him (Mr Taylor) who knows. Mrs Taylor said she had been surprised by how many people her husband knew, saying there had been a big turnout for his funeral. SPANISH police say they arrested 34 Chinese citizens as they smashed a family-run crime gang suspected of importing fake goods and laundering the profits, with the help of a chain of laundries. The raids in Madrid, Barcelona, Valencia, Cadiz, Seville and Huelva overnight broke up the largest Chinese-linked criminal gang based in Spain, operating since the 1990s, said the Civil Guard overnight. Police detained 34 Chinese nationals and seized assets worth 11 million euros ($15 million), it said. The gang may have earned more than 40 million euros ($54.64 million) a year, importing four-to-six containers a month through Valencia packed with fake tobacco, clothes and other goods bound for sale in Spain, Britain, France, Italy and Portugal, they said. The Chinese family-run gang laundered the proceeds by moving the money around with couriers, making bank transfers of less than 20,000 ($27,318) and by extending high-interest loans to compatriots based in Spain, police said. The gang recruited Chinese people it had helped to enter Spain, often taking away their passports after they arrived or opening bank accounts in their names to launder illicit gains, they said. According to police, the organisation had a branch in China, which controlled more than 30 companies including a chain of nearly 1,000 laundries and was used to conceal the source of the profits.